Praise God for each one of you praying for us as a family. Indeed, God has been giving us success in the ministry. Only in trusting Him could we be assured that everything is under His absolute control. About 15 people gathered at an apartment that Sunday to commence a church. Victor with his wife Marlene & daughter Marivic are now coordinating all the church activities under the supervision of Rey. Once a month, he committed himself to visit them for leadership trainings and pastoral counselling. Youth leaders from 15 cities in Spain gathered for a weekend consultation retreat with the vision to mobilize, unite & send passionate youths to fulfill the GREAT COMMISSION. Excellent ideas were shared, talented volunteers were recruited and immediate actions were implemented. Publicity is now being circulated. Praise God for this wonderful opportunity as Dani was appointed to be the key person to organize and coordinate this project. ART COMPANY will provide all the necessary trainings. This too will serve as a pool of volunteers for our summer campaigns, the MOVIDA FESTIVAL. MOVIDA FESTIVAL 2010 LINE-UP –May & June trips for Rey. It is expected that two weeks of outreach in each city in collaboration with various churches & volunteers will be held in Oviedo, Malaga, Mallorca & Menorca. 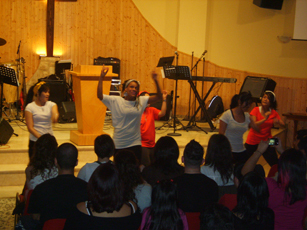 The first week is dedicated for evangelism & discipleship training in the mornings & rehearsals in the afternoons. Then proceeded by weekend full blast evangelistic festivals til the following week. Please pray for Rey as he travels to finalize all the detailed preparations for accommodations, venues of activities, transportation & logistics. Churches networking with us are all excited about this project giving their youths the opportunity to serve God & win souls during their summer break. Amen. 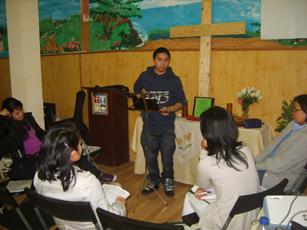 EVANGELISM IS PRODUCING RESULTS – in the VIDA NUEVA CHRISTIAN CENTER, Madrid. About 20 souls were ushered into God´s kingdom through one on one evangelism done in various places like institutes, homes, workplace & streets. Please remember them in your prayers as we do individual follow-up on each one of them. Mary, is very ill & the doctor already warned her that she has limited time to live. She is now saved and her soul is secured, although she still desires to live a little more longer. She and her family and relatives are now open to the Lord, please pray for their salvation as well. A couple in a live-in case came to know the Lord and we are on the process of helping them to sort out their lives and relationship to be able to start new life in Jesus. We need God´s wisdom and guidance on this. This and more cases of difficult backgrounds & circumstances are what we are facing as we do follow-up on these contacts. The vision to grow and maximize the time while it is day for night comes that no man can work is our motivation to act with urgency and passion to reach out the losts for Jesus! THANK YOU SO MUCH – there are so much to do to keep us busy in the work of the Lord. If only trials, obstacles, difficult personalities, complicated problems will be completely eradicated, ministry will really be so much fun and a lot easier to handle but in contrary the Lord is allowing them to happen for us to completely rely on Him. For it is not by might nor by power but by MY SPIRIT says the Lord our greatest Defender ! Your prayers and support keep us going. We love you and thank you very much. 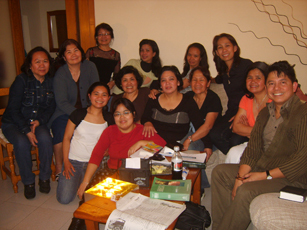 REY WITH THE MALLORCA NEW CHURCH GRP. 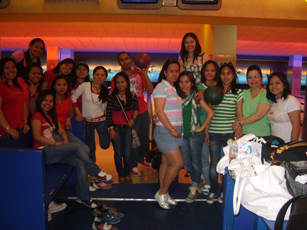 Vivs with the Madrid group during their fun day.